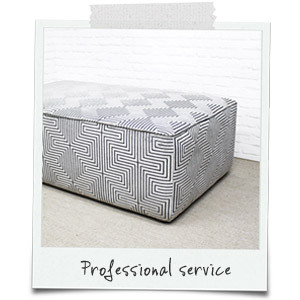 Our flexible approach to making footstools and furniture lends itself perfectly to the Interior Design world. We work with lots of Interior designers, architects and project managers on small and large projects…which are all generally bespoke! Our large range gives a great starting point but we are happy to tweak sizes, use your own fabric, meet tight deadlines and offer a trade discount too. 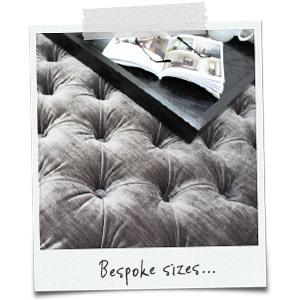 We offer a professional service throughout, including quick quotes, advice on footstool types, fire retardancy guidance and more. We know how important your clients are to you so we will do everything we can to uphold your excellent reputation. Our website has a limited number of fabric and leg options, so let us know if you have something else in mind. We have a number of designer fabric accounts, along with a range of leg suppliers, and contacts with lots of other useful companies and people! We also offer a traditional reupholstery service from our workshop in Leeds, Yorkshire. Please get in touch with any questions you have, or if you require a trade quote simply call or email across the details. The Oxford cube is a very popular choice for seating in retail shops and we have supplied these for the cycling shop Giant, and also UGG. We have also had the pleasure of working with smaller, independent stores. Footstool cubes make an ideal and practical choice for bars and restaurants. They are small, easily moved and cleaned. They can be quickly replaced if damaged and come in a variety of styles and sizes to suit your requirements. Again, Drum Stools make an ideal and very versatile option as they can be easily moved to adapt to your needs. They can be quickly replaced if damaged and come in a variety of styles and sizes to suit your requirements. Bespoke solutions and seating are a popular choice and we have experience with a range of styles. Please contact us to discuss your requirements for an upcoming project, replacement seating or repairs.